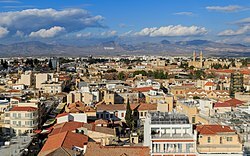 This is a list of settlements in Cyprus. The English-language name is indicated first, followed by the Greek name in Greek script (if it is different from the English-language name, the Greek name is rendered in the Latin alphabet), followed by the Turkish name. Listed last is a former name or one used in antiquity. 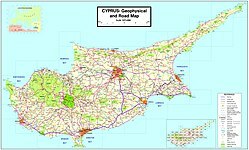 Note that even though, prior to the 1974 Turkish invasion of Cyprus, Turkish names existed for some villages/towns, due to political reasons, most of the villages/towns were given a different Turkish name. 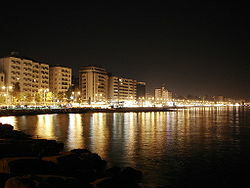 The largest cities in Cyprus are Nicosia, Limassol, Larnaca, Famagusta, Paphos and Kyrenia. Note: Some names were changed from Turkish after 1970. Most of the Turkish names were established in 1958, then some of them were changed after the 1974 invasion (e.g. Kourou Monastiri in Nicosia District). 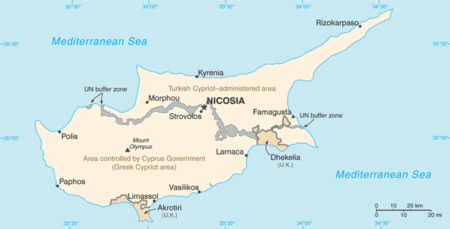 Note: Names of the towns are written as Greek name, new Turkish name. ^ Baysal, Besim. "Unending "Turkism" Attack on Settlement Areas". KTOS. Archived from the original on 4 February 2011. Retrieved 30 March 2011. 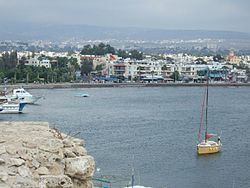 Wikimedia Commons has media related to Populated places in Cyprus. This page was last edited on 29 March 2019, at 14:21 (UTC).